Following the festive season, the usual January rush to the gout support forum is well underway. The excesses of Thanksgiving, Christmas, and New Year often take their toll on gout sufferers at this time of year. Perhaps there is also an element of more time to join forums and time to resolve to do something about gout. Whatever the reasons, the annual flood of gout support requests contains common themes. There is a general feeling that gout goes away when the pain goes away. There is also a determination, usually, among men approaching middle age, that gout sufferers do not want to be stuck with taking pills every day. Let’s examine the faulty thinking behind those themes, and the dangerous consequences if such feelings are taken to conclusion. Gout is caused by uric acid crystals that form when the level of uric acid in the blood is higher than it’s crystallization point. There are several factors that affect crystallization of uric acid, but I won’t repeat them here. Just focus on the professional rheumatologist’s recommendations that the safe upper limit is 5mg/dL. All the time that uric acid is above that level, crystals continue to form. They start in colder parts of the body, hence the common first occurrence of noticeable gout is in the big toe. Other extremities are equally common but left untreated all joints will become affected. I emphasize noticeable because crystals can grow without causing immediate gout pain. The likelihood is, whenever you notice your first gout attack, you already have a few years of crystals in and around your joints. Now, some people argue that they do not care about these uric acid crystal deposits, so long as there is no pain. As a gout sufferer, I fully understand that emotion, but you should not manage your health emotionally. There are two horrendous dangers of gout that are even worse than that terrible pain. Unlike the pain that comes and goes, these two worse dangers will permanently destroy your quality of life, if not your life itself. 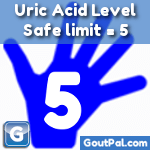 Uric acid crystals cause gout pain because they stimulate a response from your immune system. White blood cells that exist to fight invading bacteria and other foreign bodies will attack the crystals, and eventually engulf them. When they call for reinforcements, you get the intense inflammation (phagocytosis) that causes the agony of gout. Unfortunately, other cells in your bones, tendons, and cartilage get drawn into the fight. These baby cells should grow into new tissue to keep your joints healthy. Destroyed in the gout war, you lose these regenerative cells, and so your joints crumble. What starts with a little tendinitis, gradually becomes widespread osteoarthritis. It takes many years for this to cripple you permanently, but that means you have permanent joint pain in your later years when you are least able to cope. Though uric acid crystals tend to deposit in the joints first, they will form anywhere in your body that has a connection to your bloodstream. These uric acid crystals form lumps that you first notice in your biggest organ – your skin. The deposits start as small soft lumps called tophi, that gradually grow and harden into disfiguring, damaging, tumors. My tophi guidelines show many examples of these lumps in various parts of the body. As with joints, the cooler organs get attacked first. Early signs are common in the ears, hands, and feet. Though skin tophi are most common, all other organs are at risk. The dangers of tophi bursting through the skin are bad enough with the lack of mobility and risk of infection. These dangers are much worse when major organs become affected. Uric acid crystal can cause chronic kidney disease and heart disease, often with fatal consequences. Though I spoke of two physical gout dangers, most dangerous is your attitude. If you think you can play around with your diet, and maybe take some supplements, you are wrong. It is possible for some gout sufferers to control gout by lifestyle changes, and non-pharmaceutical treatments, but that takes several months, if not years to achieve, and only works for the least serious cases of excess uric acid. What are you going to do today to stop the hidden dangers that threaten your mobility and your life? The most sensible thing you can do is to start allopurinol or Uloric treatment immediately. A few months of uric acid at 5mg/dL (0.30mmol/L) or lower, will remove the threat of uric acid crystal deposits in your body. Once you are stabilized, you can assess what are the best lifestyle changes that will allow you to reduce your reliance on drugs. That way you give yourself time to take control of gout in the way you want to. It gives you time to enjoy Christmas again. If you need help to find Gout Freedom, please ask in the gout support forum.